Disrupter is the thrilling conclusion to the Seeker series that started with Seeker and continued with Traveler. Everything comes together in this final book and it’s well worth the wait. The series starts with Quin, Shinobu and John attempting to finish their Seeker training... and learning that being a Seeker is not what they thought it would be. Instead of protecting people, righting wrongs, and avenging evil, Quin’s father has perverted the sacred Seeker training and created a team of assassins to murder other Seekers. The young Seekers revolt but cannot even trust each other. In Disruptor we learn the true history of the Seekers and the Dreads and the only way anyone can be saved is if they work together. 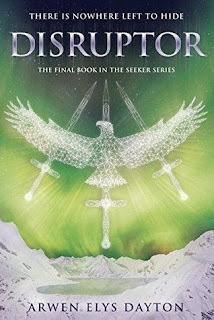 I loved this entire series and Disruptor is no different. It was written perfectly, alternating chapters with the different characters, slowly revealing the secrets and mysteries set up in the first book, and keeping the reader riveted the whole time.